No. 1 Common lumber often contains striking grain and figure patterns that are usually absent in the select grades. That's because these "abnormalities"
often occur around knots and near other natural defects. With selective or innovative cutting, you can remove and showcase them. Or perhaps you prefer a look that includes knots, splits and natural edges. Common grade boards can be downright beautiful, making more expensive higher grade boards look plain by comparison! When you look at a chart of the various lumber grades (Fig. A, page 42), No. 1 Common appears to be a fuil step lower than Selects and Better. But look closely—the difference is really only a half step. FINDING HIDDEN BEAUTY in an unsightly board is rewarding and well worth the head-scratching it takes. In spite of serious end checks, an awkward grain pattern and a waney edge, the $8 piece of No. 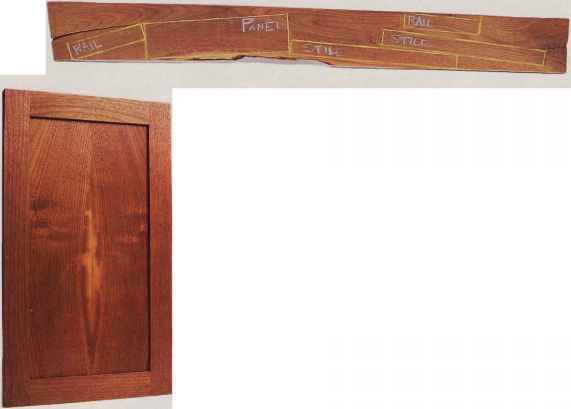 I Common walnut shown above contains all the parts for an eye-catching cabinet door.There's straight grain for stiles and rails and a piece that, when resawn, made a great bookmatched panel. No. I Common boards often contain unusual grain and interesting color and figure. 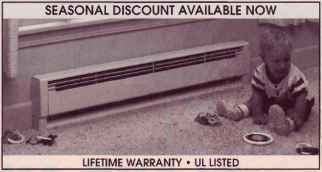 Because these usually occur around defects,you aren't as likely to find them in the higher (clearer) grades.